I'm testing out the V6II on my Fuji X-T1 with Godox AD360 and AD600 flashes. I'm using a single V6II with the Godox transmitter on top. I can get Powersync working with no issues using the simple FT16 and FX16 triggers, but when I try the Canon specific XT32C and X1TC triggers, they will not fire when Forced HSS is turned on. Any ideas here? I have also found that I can get it to Powersync with the XT32C if I use a sync cable from trigger to trigger, but it only works with the AD600 on full power, whereas with the FT16 I can Powersync with reduced flash output. I think you need two (2) V6 II in order to do HSS. With the second V6 II set to RX connected to your Godox units, but will check with R&D on Monday. As stated above, using their simple, single pin transmiters, powersync definitely does work with only one V6II. It's only the multi-pin transmitters for Canon that I'm having issues with. Would it work if you don't use the multi-pin Godox transmitter at all - not connecting it to the V6 II system, but just holding it in your hand to remote control the strobe power and to turn on the HSS mode. Then connect V6 II RX to strobe via sync cable, and mount V6 II TX on camera. I'm sure that would work, although it would be counterproductive to spend another $100 on a V6II I don't need. I would just use the old style godox trigger if I can't get the multi pin to work. I have found some information to explain the problem with the multi-pin Godox transmitters (X1T and XT32). I have verified that even when set to single pin mode, the V6II is still sensing the Canon hotshoe contacts and not firing the trigger. I was reading the X1T trigger manual and saw a custom function for a "single pin mode" and set it, I then tried HSS in both Nikon and Manual modes on the V6II and it still didn't work. I had noted previously that the V6II makes a check next to the Canon option in the flash mode when it recognizes the Canon trigger, and this was still happening even in single pin mode. That made me think that it must sense the pins, even if they are not being used. I then taped the pins on both units and they now fire. I'm hoping this is something that can be resolved in a firmware update. I'll also note, that although manual flash mode has been added, powersync still only works for Fuji X when the flash mode is set to Nikon. We just released a new firmware version, 1.1.004. BTW I think even 1.1.003 solved the manual flash mistakenly set to Nikon flash. From our testings, you will need multiple V6 II units to accomplish HSS on your Godox units when triggering from a Fujifilm camera. I'll be sure to update my firmware today and retest. "BTW I think even 1.1.003 solved the manual flash mistakenly set to Nikon flash." I can verify that on this firmware, Fuxi X cameras will only power sync in the Nikon flash mode, manual does not work. I have also found in my continued testing that the AD600 is looking for a HSS signal from the transmitter, and the only reason I'm getting powersync at full power is that the flash duration is long enough even without HSS turned on. I have verified that using the XTR-16 2.4G receiver in the USB port on the AD600, it will powersync at all flash power settings and all the way to 1/4000. So basically, even though the flash is set to HSS, it doesn't turn it on unless the transmitter commands it. This is ignored when the flash is triggered using the USB port, which seems to just work as a standard sync port as it doesn't support power control. This is something that hopefully Godox can solve with a firmware update to the AD600 if they program the manual HSS setting to override the transmitter. You are correct. this problem is fixed in 1.1.004. Can you share a photo of your setup? Hi, did you managed to make it work? The Godox Ad360ii with only one Cactus V6ii and the X1 Godox trigger on top? With both, Power sync and HSS? I have that setup, but still waiting for my Cactus V6ii to arrive, I would love to hear that it works, and won't have to buy a second V6ii. I've only tested with the godox lights and using one V6ii. First thing to do when you get the V6ii is update the firmware! With the V6ii on camera and the X1T-C on top of the cactus, camera mode Fujifilm, flash mode Canon, HSS mode to normal HSS, forced HSS on and make sure you do the 1/1000 shutter learn. At that point you should be set! Thank you very much! I have the Godox and its trigger, but have a different camera, a Pentax 645D. But apparently, it works with that camera as well. The Cactus will get here on Thursday, and I'll make some test and let you guys know how it went. @Pablovi: For your Pentax 645D you do not have to perform a "LEARN HSS" step (the calibration shot at 1/1000s). That's only necessary for most Fujifilm cameras that do not natively support HSS. The tip about updating the firmware straight away is really good and applies to all sorts of camera systems. In particular with respect to using another trigger on the the V6II, the latest firmware version will make your life easier. Good luck with your test! Thanks! It wil get here tomorrow, and I'll try it out. Had to buy a new Godox AD360ii with the X1 trigger, because the older one is in another city, and don't know when I'll get it back. Can you update the firmware in MacOS? Or only in Windows? I see tow downloads, one for Windows, and another one for MacOS, but both have different versions. Will I be able to upgrade to the latest one with MacOS? Or do I have to use Windows? For example, I can't upgrade the X1 trigger firmware in Mac, only in Windows. ...Will I be able to upgrade to the latest one with MacOS? Or do I have to use Windows? You can update firmware of your Cactus devices in both Windows PC and MacOS. Is there any update from your test? I hope there is a good news from you! I think by putting other brand's trigger on top of V6II to trigger other brand's strobes is a brilliant way to sell cactus products! 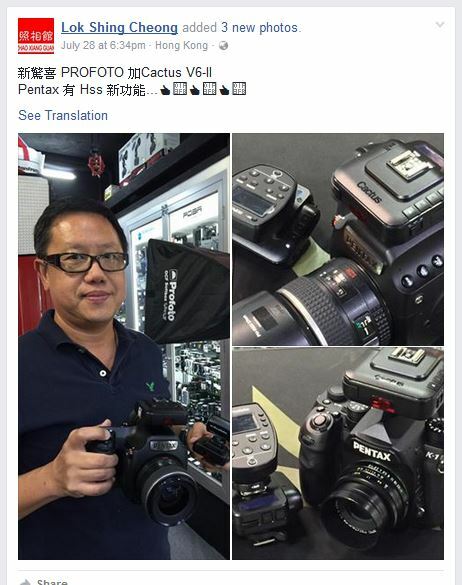 It opens opportunities for cactus V6II to existing users of Pantex, Fuji, Olympus, Panasonic cameras who wish to use their strobes system where has no support previously. @Antonio I have to second what HanSolo said. Cactus could sell a bunch of products with just that one feature. Others are improvising already, by placing "another brand's transmitter" on V6 II RX unit. I have post elsewhere before, and I will post again - a Pentax K-1 and 645Z can trigger a Profoto B1 via the Air Remote. I am a little confused... The pictures that you sent, appears to be a Profoto remote sitting atop a Cactus V6ii, but how does it actually trigger the flash itself? In this example the Cactus V6 II on the camera is triggering the second V6 II as a receiver, and that has the Profoto Air trigger on top, which gets fired by the V6 II receiver and in turn fires the Profoto strobes. So in this case there are two wireless hops. One between Cactus trigger and receiver, and the second between Profoto trigger and receiver. The other way of doing this is to put the Profoto Air trigger on top of the V6 II transmitter on the camera, and not use a V6 II receiver at all. In this case the V6 II is acting as an HSS enabler, and also doing camera format conversion so the Canon or Nikon version of the Profoto Air transmitter thinks it is on a Canon or Nikon camera. Thanks @paulster for answering, you've nailed it. FYI we are still amazed at how such a daisy-chained setup would work even in HSS as anticipate delays with the two wireless hops. Indeed. I'd love to see a photo taken in a studio of a solid background using this method to see whether it is indeed managing to get uniform illumination, or whether they've tried it outside and not noticed any banding. I'll be really surprised (and impressed) if HSS is working perfectly with the delays introduced by two wireless hops. I tried mounting the X1N on top of the V6II but it wont trigger unless I hook a PC sync cable between 2 transmitters. Switch on the X1N first, then the camera, then the V6 II. The V6 Ii should be able to detect the transmitter as a Nikon flash device. I made a post earlier today in Suggestion of this same issue. I'm not shooting with a Profotto but Interfit and want to achieve the same results. Have the Cactus profiles translate between my micro-two-thirds cameras and the remote enabling HSS. This would allow the remote to talk directly to the Interfit S1 without having to use Cactus RX connected to the moonlight with a PC sync cable. It's not so much added cost, it's just additional failure points, added gear or remote shoots, and increased setup time. How exactly did you get this work? Ah-ha, so you need HSS and not TTL Pass Through? ... This would allow the remote to talk directly to the Interfit S1 without having to use Cactus RX connected to the moonlight with a PC sync cable. The talking part is simply sending a firing a signal. You cannot turn on TTL Pass Through from say an Olympus camera to a Canon system transmitter. Also, check if you can turn on HSS on the Interfit S1 without setting the transtmitter in TTL mode.